Jefferson Pierce knew that when he donned his Black Lightning gear again, he was putting a target on his back. He’d spent years working to strengthen his community through his work as a principal, and that was supposed to be enough. But then Green Light, Lala, and the kidnapping of his daughters necessitated the return of Black Lightning. Jefferson Pierce wasn’t enough for Freeland. Freeland needs more than just a principal trying to shape its young minds. It needs a hero who embodies the interests of the community and gives them hope. Jefferson understands that Black Lightning fills that need, that the idea of a visible, black vigilante is inspiring to the people of Freeland. He’s the necessary voice for those who can’t speak up. In other words, Black Lightning is larger than life. The mystique of Black Lightning, and the superhero in general, is that he operates outside of normal social and political constraints. Where Jefferson Pierce has to work within a broken system, one that can send a bright young kid like Lala into the 100 Gang despite his mentor’s best efforts, Black Lightning can operate outside of it, working to correct the injustices inherent in the system. For ten episodes Black Lightning has mused on how a superhero can come to represent the social and political grievances of an oppressed and ignored community. “Black Jesus: The Book Of Crucifixion” pivots its focus, showing that no matter how big the superhero may be, he’s still beholden to the bias and limitations placed upon the man underneath the mask. One of Black Lightning’s greatest strengths in its debut season is its personalized approach to conflict. The story of a shady government organization running experiments on kids through the use of a drug called Green Light is the kind of story that boasts every opportunity to go off the rails, to expand its scope far beyond what a 13-episode season can handle. Black Lightning combats that by making sure the Pierce family are at the center of everything. Even as Green Light ravages Freeland, the focus remains on the Pierces and theirs struggles, be they familial or superhero related. By doing so, Black Lightning allows for a personal connection with the narrative that amounts to so much more than just wanting the good guys to come out on top. The problems facing the Pierce family don’t just feel like typical issues superheroes have to face, but rather of a piece with who they are even without their disguises. “Black Jesus: The Book Of Crucifixion” isn’t as action-packed as the previous two episodes, but rather a necessary pit stop on the way to the finale. This is an episode that meditates on the fragility of black lives, using Jefferson’s arrest, and his need to keep his identity as Black Lightning secret, as a way to explore a system that exponentially brings violence to the doorstep of black families. Jefferson’s arrest and processing is spread out across the episode, and that feels like an intentional choice. There’s no quick fix here; we see evidence get planted, Jefferson taken into custody, and then roughed up while being processed in prison. Black Lightning is nowhere to be found. Instead, there’s only Jefferson Pierce, who’s just another black man hauled off in cuffs on a trumped up charge. Jefferson is dehumanized throughout this episode, all of his community engagement failing to act as a shield for his black body. 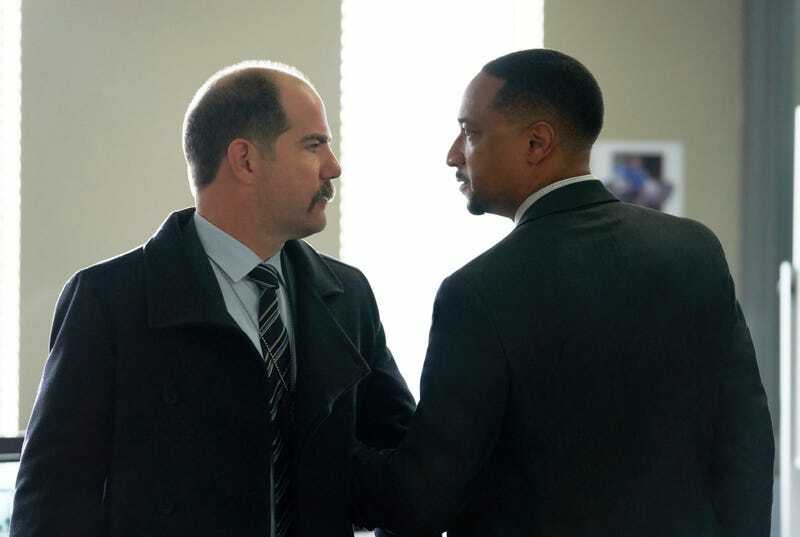 By truly giving time and space to Jefferson’s experience in custody, the episode manages to explore the restraints he must show when he’s not Black Lightning. Jefferson may be the smiling, welcoming principal who inspires his kids to take control of their lives, but to corrupt cops he’s just another black man. Is Deputy Chief Cayman racist? I don’t know. His pursuit of Jefferson is more about corruption than anything else. With that said, the ease with which Jefferson can be locked up is certainly a comment on the racism that’s built into the criminal justice system. When the local news interviews members of the community about the arrest, one resident says that it’s yet another case of the government finding a way to take down a black man who’s working to lift up his own people. He’s not wrong. The A.S.A.’s main directive, thirty years ago, was to pacify the population of Freeland. Oppression is the goal, and that means the prominent voices of resistance must be silenced. “Black Jesus: The Book Of Crucifixion” is so stirring because of how it uses superhero tropes to explore the unique experiences of the Pierce family and the community they are a part of. 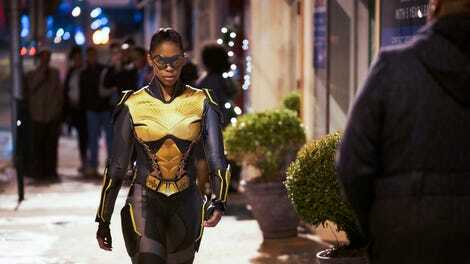 Black Lightning isn’t simply a hero for a city. He’s a hero for a community, and that makes a difference in how the show resonates each week. There’s a reason that the most familiar superhero storyline of the season resulted in the show’s worst episode. Black Lightning doesn’t shine when it’s simply engaging with the traditional. It shines when it’s offering up a unique perspective. This episode is one of the best examples of what this show can do at the height of its powers. It’s a moving, empathetic, complex, angry hour of superhero TV, one that understands there’s a great cost to challenging the system, whether you’re a superhero or a principal. Apparently Kara is fine with being the spotter for the A.S.A., but gets all flustered by Jefferson’s arrest. That’s some wonky morality, Kara! I really like that Gambi and Jefferson come back to each other at the end of the episode, but not fully. Jefferson still feels betrayed, but he also understands what his friend has done for him. It’s complicated and untidy, which is great. “Are you resisting?” used as a weapon. Absolutely terrifying. Definitely wanted those kids to start throwing down with the corrupt cops. Inspector Henderson? That’s Deputy Chief Henderson to you. This week in the Black Lightning soundtrack, it’s a perfect use of Bob Marley as a contrast to Jefferson’s dehumanization in processing.